Six months ago playing sport I fell. My knee swelled and I had a locking feeling (there was no pain or indication at the time that it was more than just a fall). I continued to play the next two days although there was swelling and pain; once I warmed up it wasn't to bad. After physio, ice and rest it was no better. After an MRI I was sent to the surgeon who did knee arthroscopy with a patella release, removed a a large bit of bone that was floating, cleaned the knee up, and also removed a part of the meniscus. That was six weeks ago. The doctor has also told me I have degenerative arthritis and to stop playing sport. 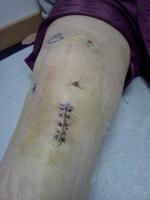 He has also told me I will need a knee replacement in 10years. I am 46yrs old. While stopping sport has upset me beyond words, my concern now is that I can not straighten my knee. I did all the iceing and exercises that were asked of me and more. I am still having physio (with a great physio) twice a week and now there seems to be no further improvement. I can ride the bike, do leg raises, lunges and there also isn't much pain. I cannot squat still. What am I doing wrong, can you suggest any thing that may help. If I can get back to sport what are the consequences?